A little over a year ago, during cold days, I was snuggled up reading what I think of as old ladies’ series. Pleasurable, extended “mmm”s. Around the same time I came upon a book title, a copy of which I purchased simply because the play on words made me laugh ... and I do love laughing! 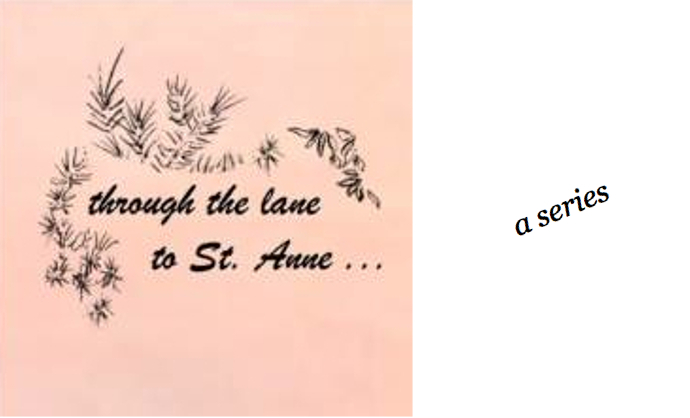 Though my St. Anne series is nothing about nor like “Swine Not?” I give a nod to that author for his part in my play. For a long time I’d been using my writing for tough topics. This weaning writer had switched his own focus, turning to pen a lighter story about a friend’s pig, ergo his “Novel Pig Tale.” The idea that I too could, heck, write anything fun and bright that might also bring enjoyment to readers, as other authors’ series had brought me ... Why not! From there I did two things: though forgoing would require resoluteness akin to giving up afternoon tea (which, thank goodness, I did not see need), I ceased reading fiction for all this long while because I preferred to clear my head of other characters’ voices and writers’ styles. I also kept that whimsical title out on my table. Every meal, the more it tickled me the more I thought, why not write a series with a setting to which I’d like to return every morning, amidst characters whose company I would enjoy. So I did. I love how the ‘Swine Not’ and ‘old ladies’ series’ showed up to inspire the platform and calligraph the category in which I would write next. Whatever brings you through the lane to St. Anne and what you make of the goings on, in addition to what I continue to hatch with Chet and the others ... thanks for coming round!